Showing appreciation for your employees' work is important to create a loyal, engaged workforce. One of the easiest ways to do so is to present awards to employees. These will help to not only boost the morale of the recipient but of all staff as studies have found that when employees witness one of their colleagues being awarded for good work, their satisfaction with the company will increase as well. If you're trying to decide whether to incorporate employee awards into your company culture, have a look at the benefits of showing appreciation below that will help you make a decision. Thanking your employees for a job well done can make them happier at work which will translate to a greater overall job satisfaction. 7 out of 10 people who receive appreciation for their work, report to be happy with their jobs while that number drops down to 4 out of 10 people for those who don't receive thanks. Those employees who feel their work is being acknowledged are found to be more engaged at work and less likely to leave the company. With the costs for hiring and training new employees estimated to be $4,129 (£3,130), showing appreciation is a simple solution to avoid this problem. Studies have found that when employees feel like their contribution is valued, their productivity increases. 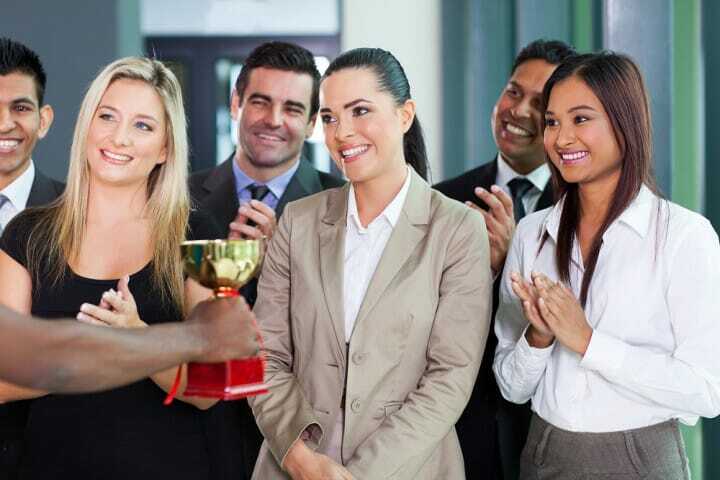 With productivity directly linked to company growth, presenting awards to show employee appreciaition can be an easy-to-implement method to boost growth. With so many valuable benefits, we thought it essential to offer a selection of employee awards to our customers. Our wide range includes traditional glass awards as well as glassware such as tankards, wine glasses and champagne flutes that will be engraved with your message. All of our awards are engraved with high quality lasers and we offer templates for the most common award types including awards for outstanding service, length of service and retirement. If you have your own template ready to go, you can simply upload it to our site and we will create the award for you.